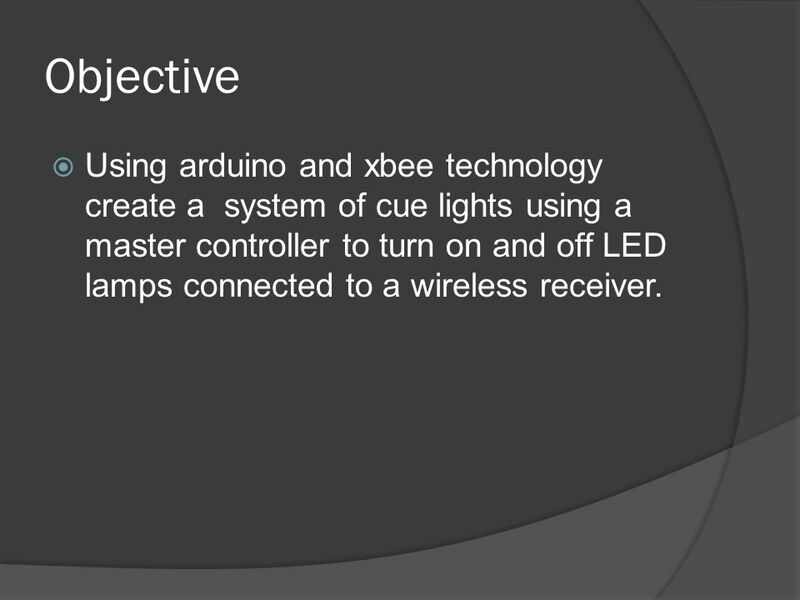 2 Objective Using arduino and xbee technology create a system of cue lights using a master controller to turn on and off LED lamps connected to a wireless receiver. 11. 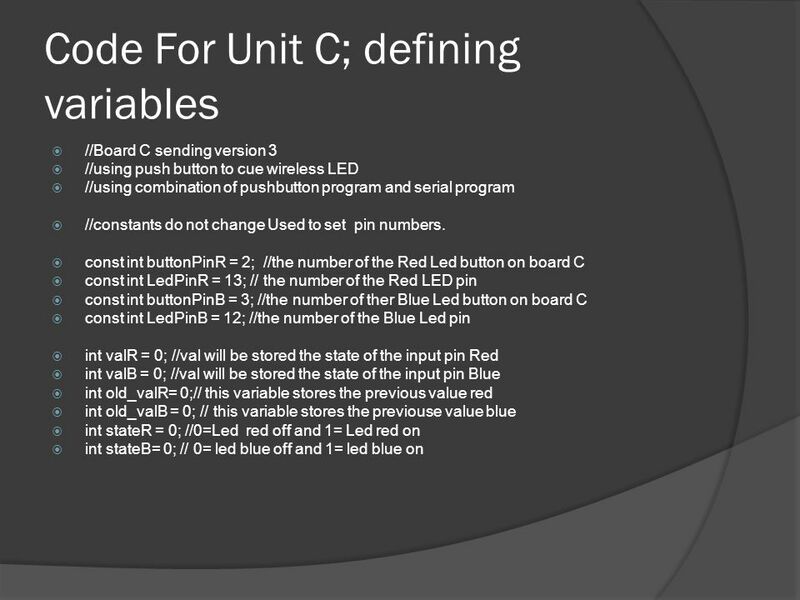 Set up unit C and A test control of one LED 12. Analyze data 13. 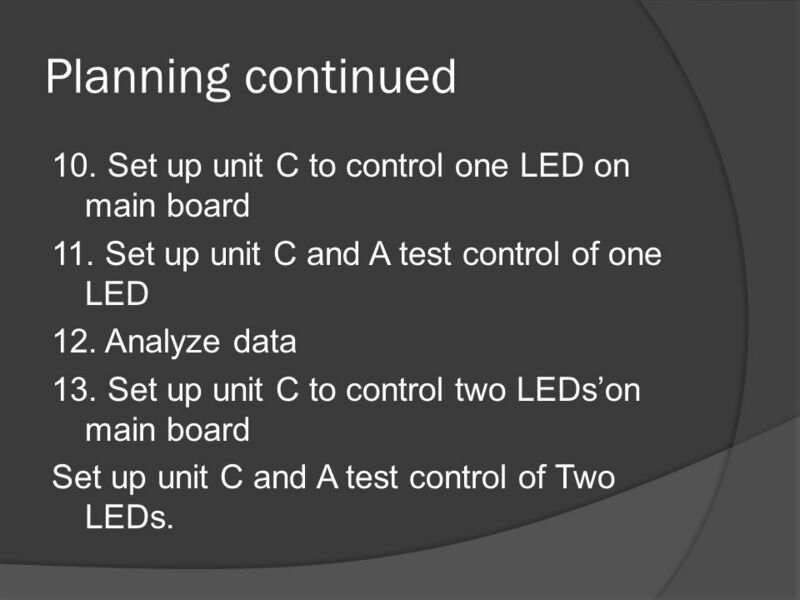 Set up unit C to control two LEDs’on main board Set up unit C and A test control of Two LEDs. 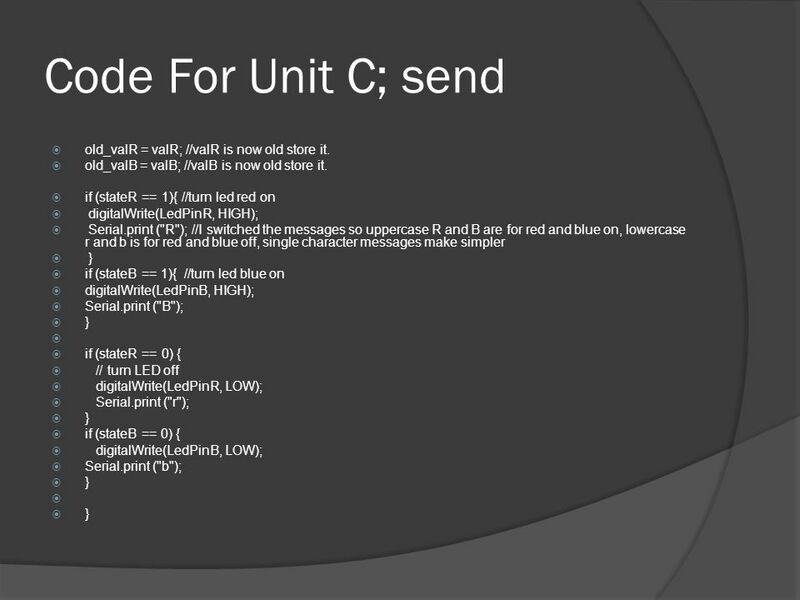 12 Code For Unit C; send old_valR = valR; //valR is now old store it. 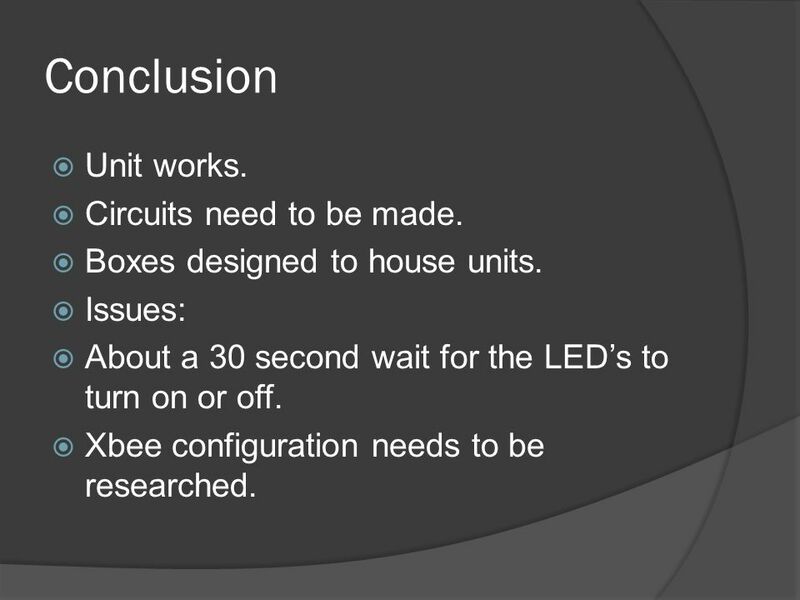 19 Conclusion Unit works. Circuits need to be made. Boxes designed to house units. 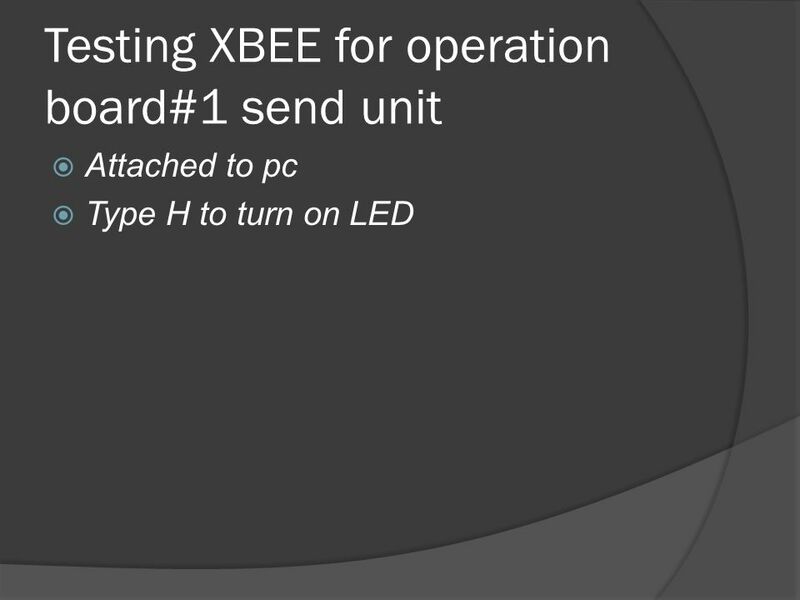 Issues: About a 30 second wait for the LED’s to turn on or off. 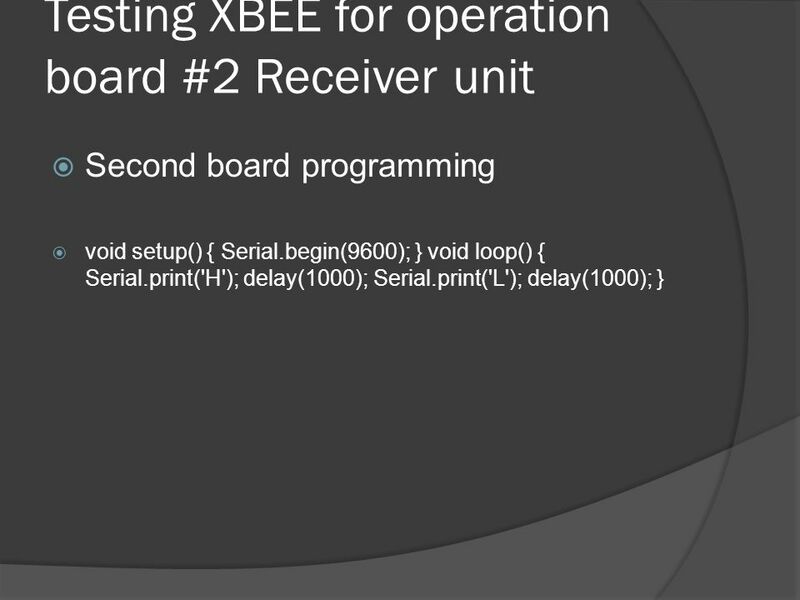 Xbee configuration needs to be researched. 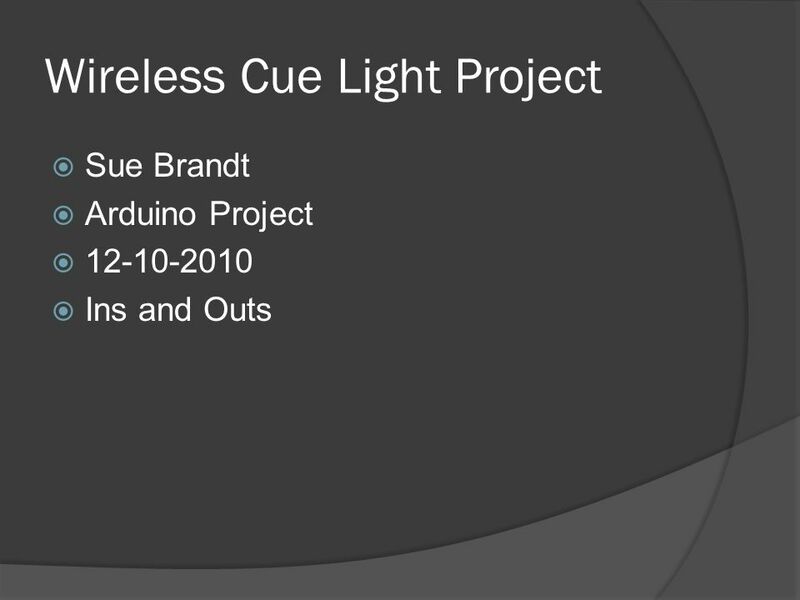 Download ppt "Wireless Cue Light Project"
Book Project Sue Brandt Arduino Project Interactive with LEDS. 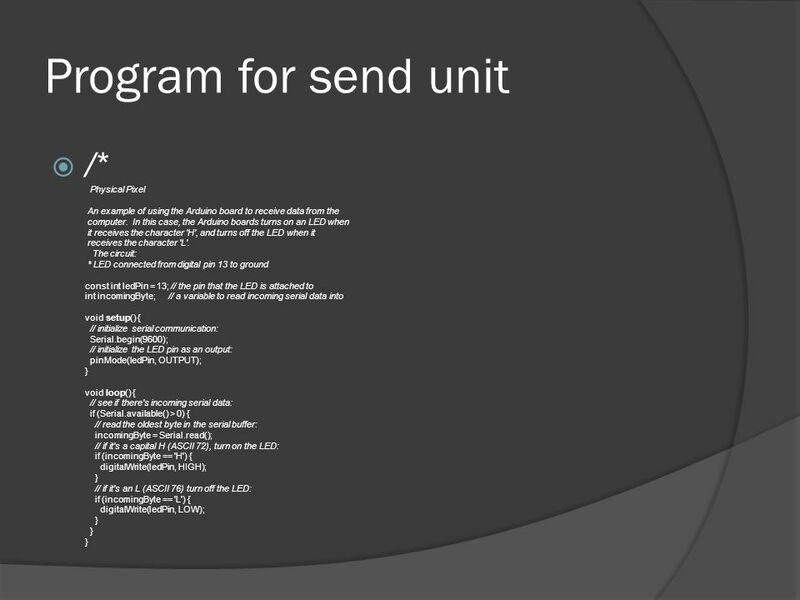 EMS1EP Lecture 7 Program Structure and Serial I/O Dr. Robert Ross. 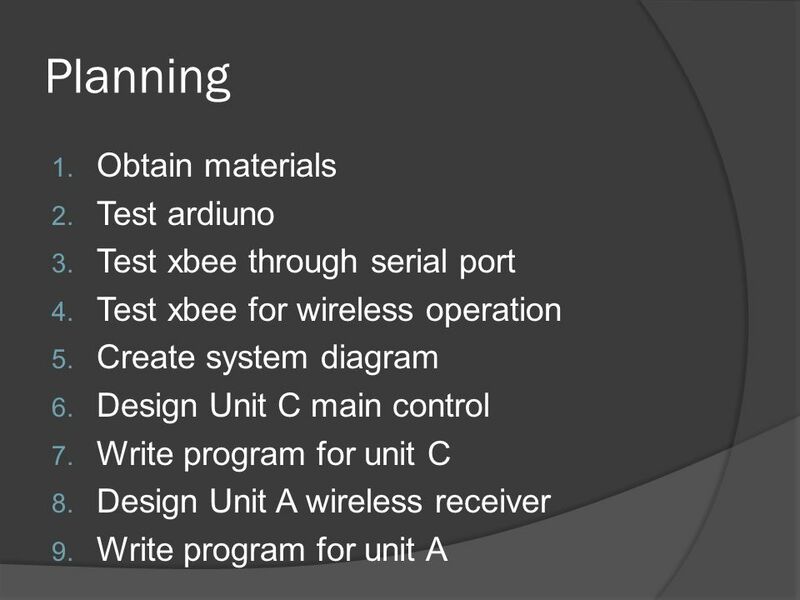 ARDUINO CLUB What we’re really doing. 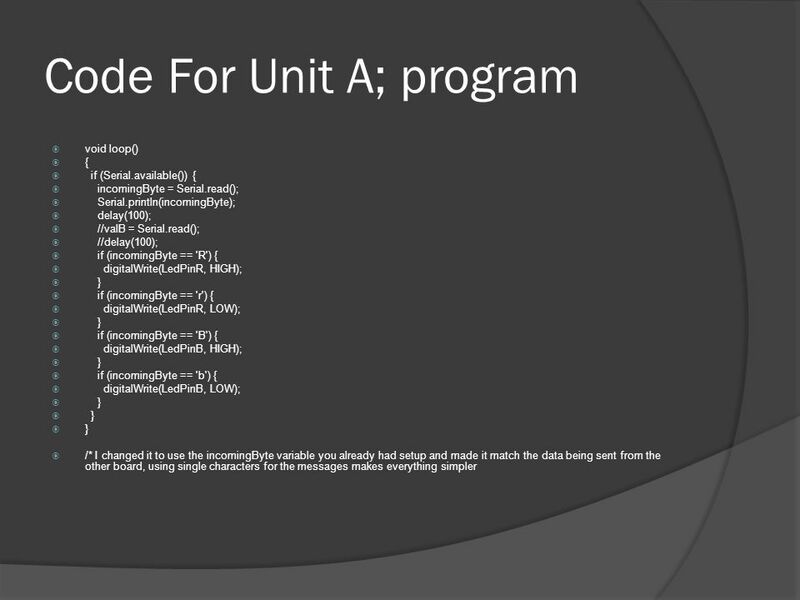 BASICS The setup() and loop() functions. Anurag Dwivedi & Rudra Pratap Suman. 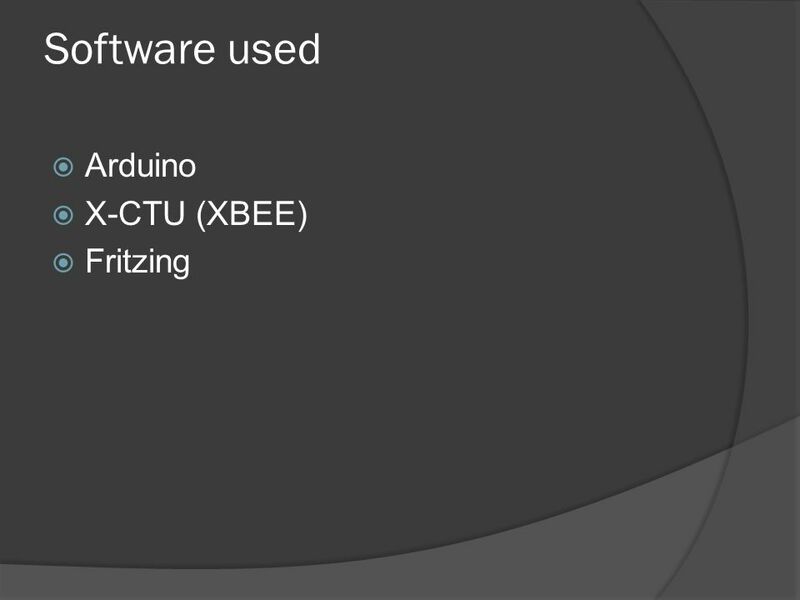  Open Source electronic prototyping platform based on flexible easy to use hardware and software. 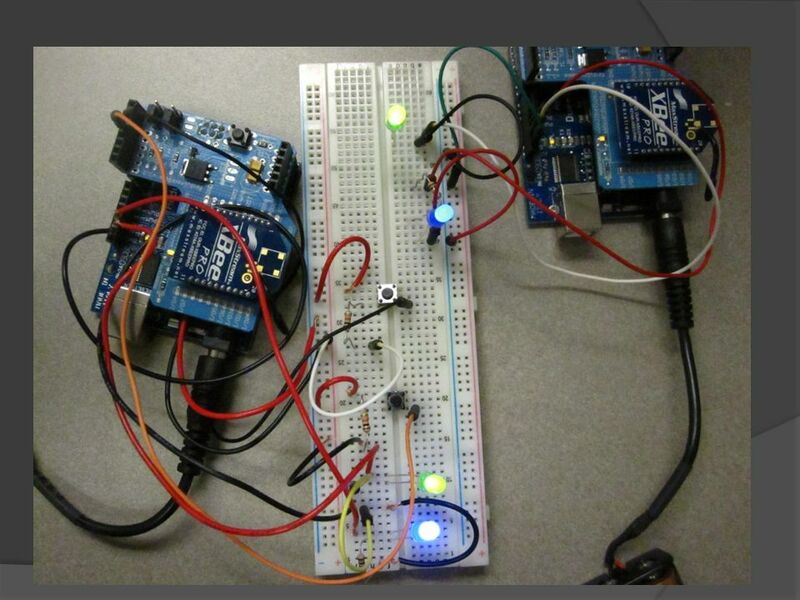 How to use Arduino By: Andrew Hoffmaster. Embedded Sumo 1T4 – 1T5 UTRA. Panasonic EVE-KC2F2024B 24 pulses per revolution 6mm diameter flattened output shaft output type: quadrature (incremental) minimum life: 15,000 rotations. 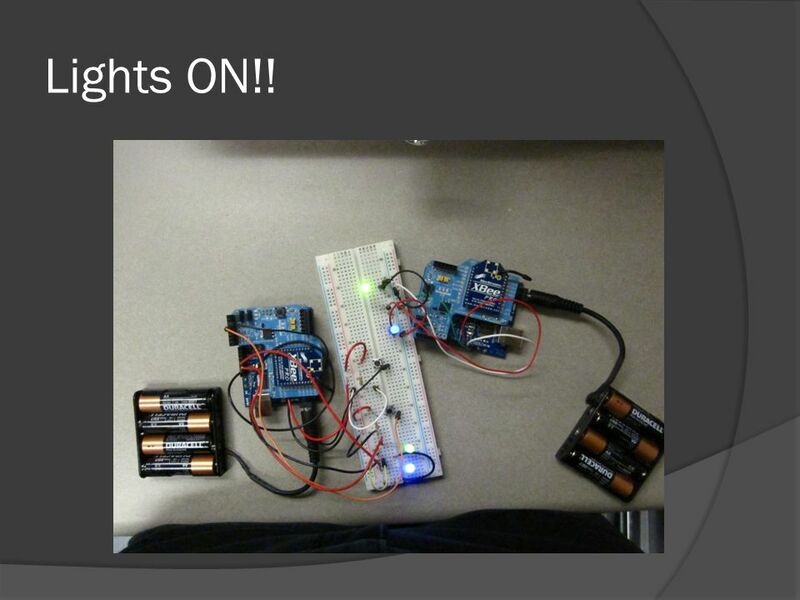 Re-programming the Simon Says with Arduino Linz Craig, Brian Huang. 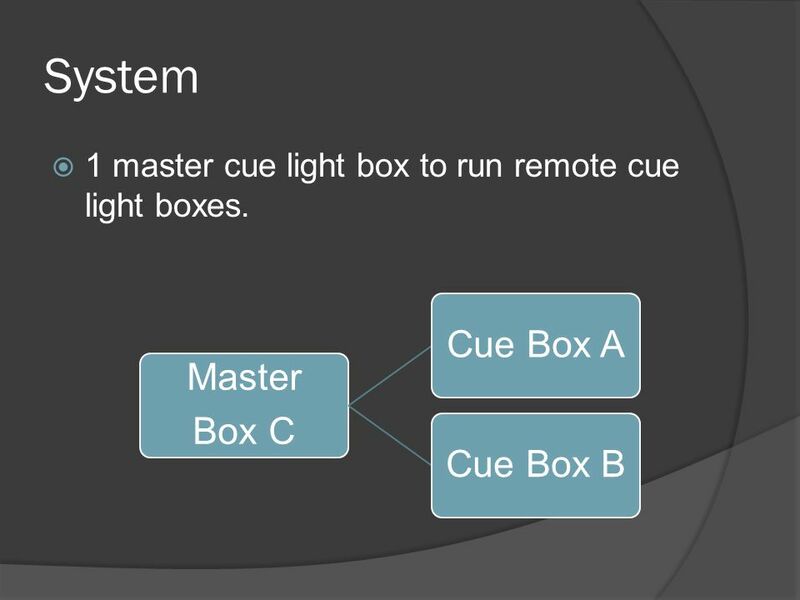 Digital & Analog Inputs. 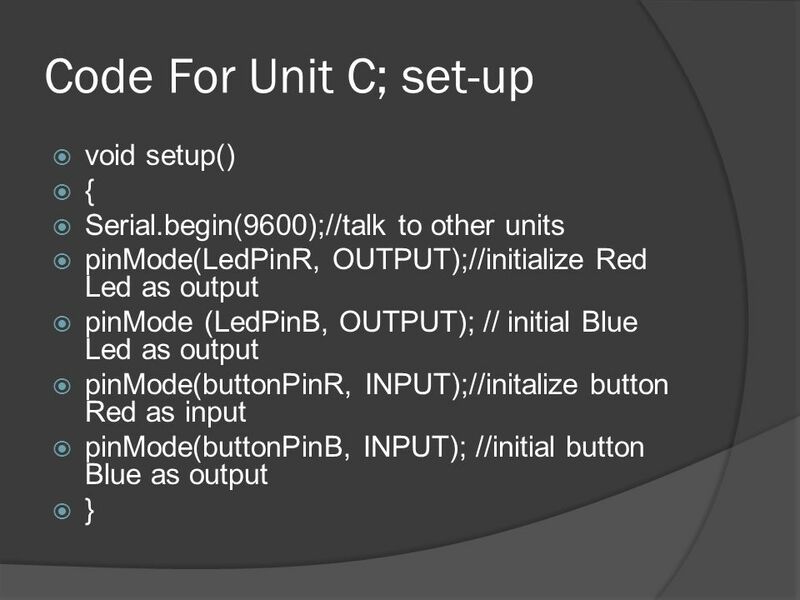 Review Fundamental parts of an Arduino program are … Setting output types using pinMode. 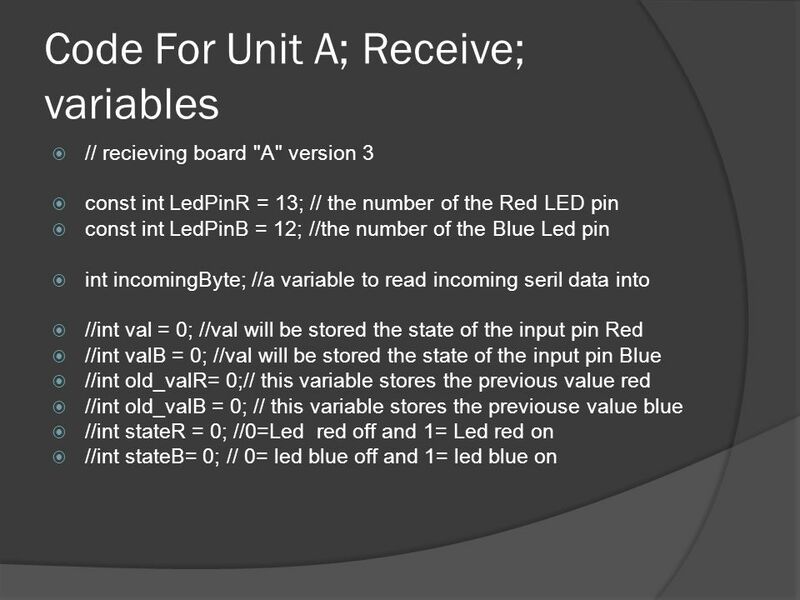 Declaring variables Can write a digital. 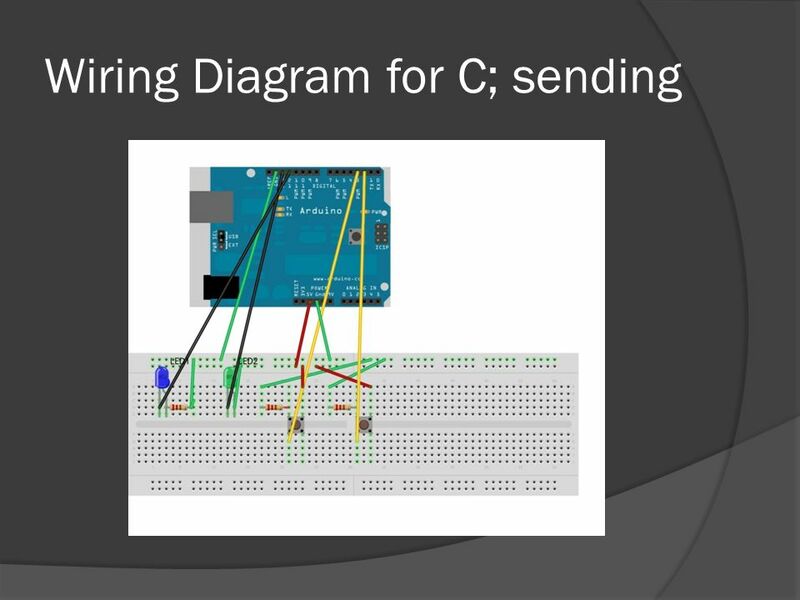 Introduction to Arduino Programming January MER-421:Mechatronic System Design. 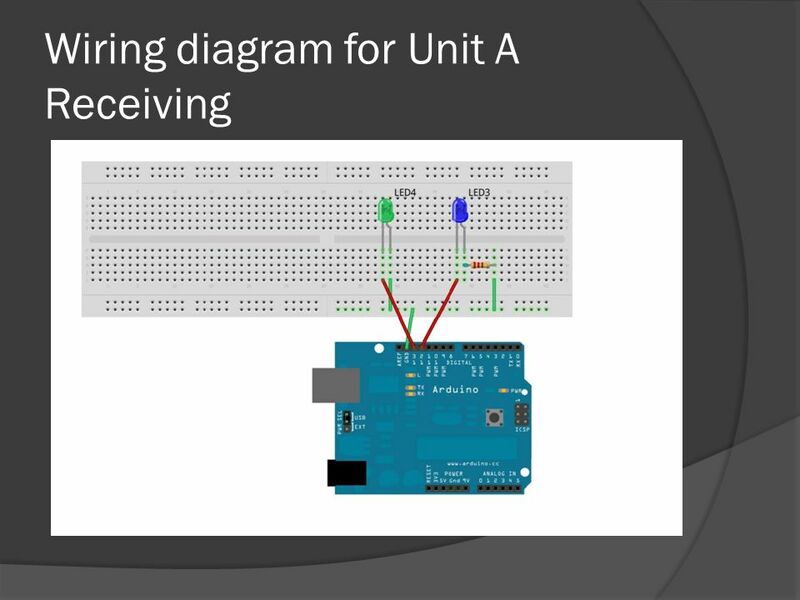 Living with the Lab Using Your Arduino, Breadboard and Multimeter EAS 199A Fall 2011 Work in teams of two! 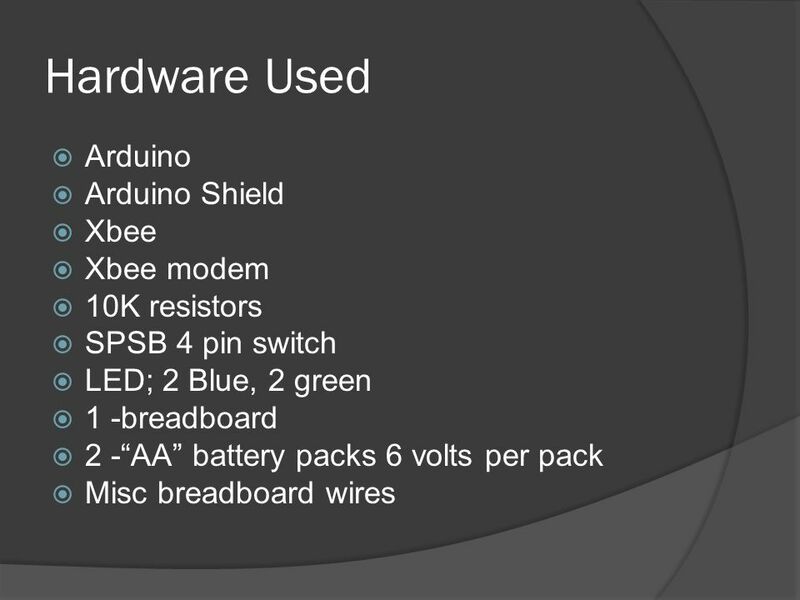 Intro to Arduino with LilyPad Make a MakerSpace, Artisan’s Asylum Linz Craig, Chris Taylor, Mike Hord & Joel Bartlett. 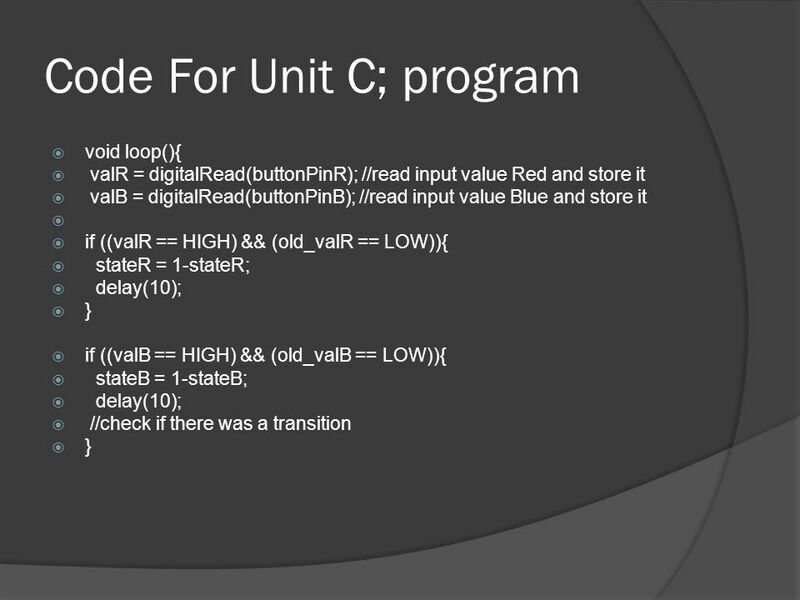 Intro to Programming and Microcontrollers. Activity Group into pairs and sit back-to-back. Pick one person who is going to draw. The other person will. 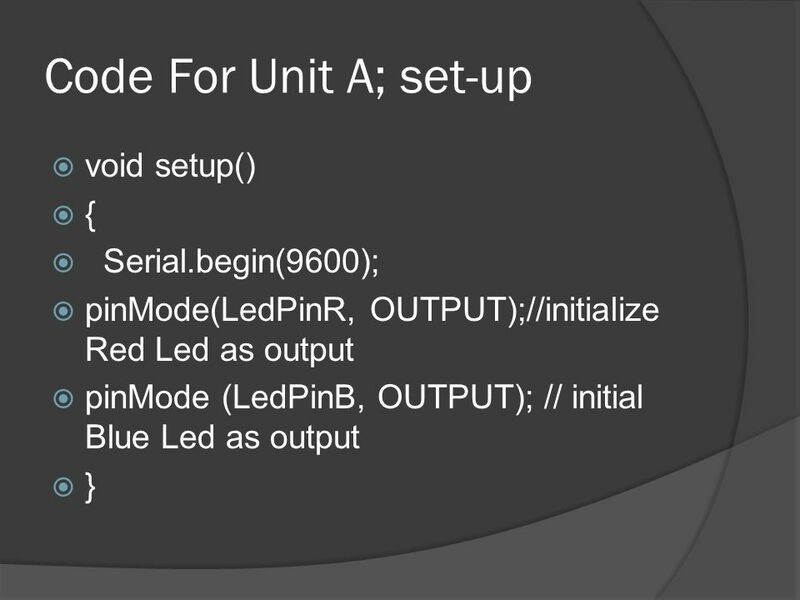 Working with Arduino: Lesson #1: Getting Acquainted with the Kit EGN1007.